Before installing your new mast, compare the old mast with the new one. They need to be identical in every way. If they are different, you may have an after market power unit. Also it is very important that you NEVER cut the white cable on the new mast at any time. Remove the special nut, ( by turning counter clockwise, looking down at it ), along with the Grommet and Gasket. [ Photo 2 ] below shows a socket being used, but a common small needle nose pliers can be used as well by sticking the nose of the needle nose pliers into the slits and turning counter clockwise, looking down at it, ... See [ Photo 2 ] below showing it being done ..... OR ...... You can use a Small Screw Driver as well, see [ Photo 1] below showing it being done. Then as you have someone turning the radio on, and as the mast begins or tries to come up, ... grab hold of it and assist it out as the power unit feeds the mast out, as the [ Photo 2 ] below shows the mast coming out as the radio has been turned on ... taking note which direction the teeth on the plastic cable are facing ( the teeth will face either toward the front or the rear of your car ) so you know which way the new mast cable is to face when you put it in .... If you are not sure which way the teeth face, look at [ Photo 2 ] below, note that the teeth face the main gear assembly when the mast is inserted into the storage drum, .. determine which way the teeth will be by looking at your power unit, again it will always face the main drive gear assembly. Make sure that the short outer grounding/retaining sleeve ( as what is on the outer portion of NEW antenna mast ) [ See PHOTO 3 Below ] has come out with the old mast, this is very important, as this is what holds the antenna mast in when the nut is fastened, as it holds down the mast ..... Honda and Acura cars are notorious for only half of the sleeve coming out when the mast is removed. IF the old mast and grounding/retaining sleeve are out then proceed with STEP 4 below ....... If you cant get the mast out proceed with the STEP 3 below. What we found that works best in removing a stuck mast is cut the largest mast tube 1 inch from the top of the largest section of the mast, so you can fill the hollow of it with a drill bit so that when you put a vise grip on that mast it will not collapse. By doing this it also allows you to put major force on the vice grip so you can now take a hammer and hit the vise grip in such a way so you can hit the mast out. If at this time the old mast comes out proceed with installing a mast below Step 4. Compare the old mast with the new one, the length of the white teethed cable MUST be the same length of the one you took out of your power unit ( DO NOT CUT THE NEW MAST CABLE ) .... If the cable is not the same length, then you probably have a broken piece left in your power unit .... If the cable is shorter proceed with Step 5 .... If the over all Collapse length of the stainless portion of the new mast and diameter are the same with the old mast, along with the white cable length continue with Step 6. There are occasions where the antenna cable breaks off in the power unit and this will not allow the replacement mast to be pulled in all the way, because the storage drum can only hold enough cable for one mast. In this event you will have to REMOVE THE POWER assembly from the car [ SEE PHOTO 4 ] BELOW as to how in General Mounting of a power unit is. 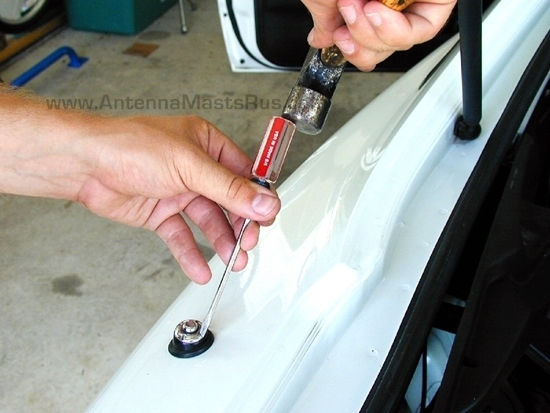 For a REAR MOUNTED ANTENNA, go to your trunk remove the power unit from the car. 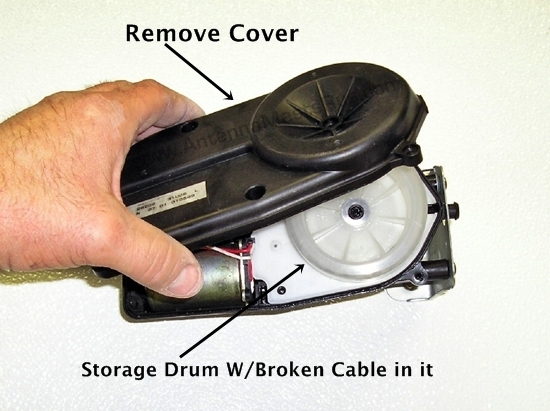 Now remove the cover from the power unit, once this is done you will see a circular plastic doughnut looking drum, pull it out and in it will be your broken cable. This is not a difficult job, its nothing more than removing some screws and bolts, nothing will ever spring out at you when you remove the drum cover ... Once the cable is out, clean the grease out of that drum assembly and put some new grease in, which can be any wheel bearing grease, do this before you reassemble the power unit. See Photo 5 below for how in general a cover and drum will look like. Now reverse what you just did and reinstall the power unit in the car and proceed with, Step 6. For a FRONT FENDER MOUNTED ANTENNA, first remove your right front tire from the car. Then under the fender you will see a plastic pan or shield, remove it. Once that pan is removed then you unbolt the power unit from the chassis of the vehicle and let it dangle under the fender so you can work on it. Now remove the only cover from the power unit, once this is done you will see a circular plastic doughnut looking drum, pull it out and in it will be your broken cable. This is not a difficult job, its nothing more than removing some screws and bolts, nothing will ever spring out at you when you remove the drum cover ... Once the cable is out, clean the grease out of that drum assembly and put some new grease in, which can be any wheel bearing grease, do this before you reassemble the power unit. See Photo 5 below for how in general a cover and drum will look like. Now reverse what you just did and reinstall the power unit in the car and proceed with, Step 6. Insert the new mast cable into the top of the power antenna tube with the teeth facing toward the direction that it was when you removed the broken mast ... ( SEE PHOTO BELOW ) Then have someone turn the radio off,.. as the power unit begins to pull the new mast in, guide the new antenna into the power unit, as it pulls the mast down into the power unit, it may on the first try not pull the mast all the way down, don’t worry, install the grounding sleeve and the outer nut and turn the radio on and off a few times as this will center the new antenna mast. then, "Voila! The mast is installed." The actual Oceanis includes a design just about all its, however you can observe the sun and rain of these We mentioned previously, as well as fake rolex sale I actually do not really think about which to become a poor point. The actual Rado HyperChrome 1616 had been revealed from Baselworld 2016, as well as snapped up my personal interest like a really good looking watch from the manufacturer lots of could neglect. The influenced through the brand's classic Cape Horn assortment of the actual past due sixties revisited along with brand new supplies along with a modern motion, the actual HyperChrome 1616 is actually worth a significant appear through purchasers.